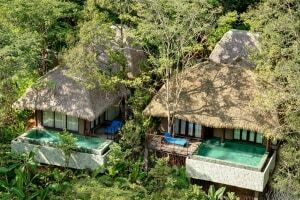 Amidst the secrets of the rain forest, lies a designer resort with 38 exclusive rooms. 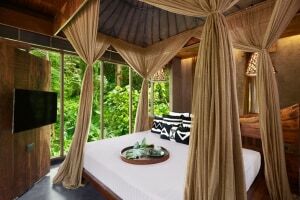 Each room offers soothing solitude, nestled among lush flora woodlands leading to the dazzling Andaman Sea. Crafted with precision, every room offers an extraordinary experience from the architectural novelty to the private pool featured in the extended terrace. Two in-house restaurants and bar shall satiate you with their delicately prepared dishes and refreshingly unique drinks. In vogue with the tranquility of the resort, go on a sensory voyage with treatments at the Mala Spa. Breath-taking surroundings and extreme privacy make this a natural choice for couples. A vacation is both for your body and mind. So, allow your body to be revitalized at this spectacular fitness hub that provides weight training and cardio equipment. Stay in the pink of health with a session of personal training sessions as passionate fitness professionals guide you toward your goals. The exotic interiors of this restaurant will entice you to spend long hours savoring your meals. With an assortment of Western and Thai dishes and manifold options to choose from, they offer breakfast, lunch and dinner. Wholesome and authentic cooking techniques are used, with fresh, locally sourced ingredients. If you're here on a wellness retreat, try out their smoothie shot with herbs right from their garden. Wheat-free, gluten-free, sugar-free or dairy-free food is made available, if requested. Dine in sophistication at the Mala Restaurant with stunning views accompanying your meal. 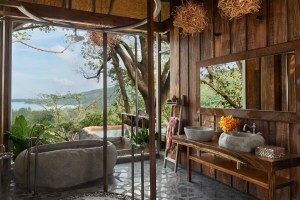 You could also bite into tasty tidbits at the relaxed Mala bar as you sip on a well-crafted cocktail. Lounge on any of the chairs by the pool as you are served from a diverse snacks and drinks menu. With butlers that shall attend to your every need, enjoy the pampered feeling of a luxe lifestyle while the lapping sound of water accentuates the opulent mood. If you are on a diet or allergic to certain food, the chef will wholeheartedly incorporate your needs into his cooking. Escape into a voyage of the senses at the Maya Spa that intends to leave you with a holistic experience. Pamper yourself with organic products as you choose from a diverse menu of treatments and experiences. You will wake up renewed at one of their eight exclusive treatment rooms as expert therapists work on your tense muscles and soothe your mind of its anxieties. All the techniques used are a blend of the ancient and the modern, to meet your individual needs. An oasis enveloped by tranquil woods, immerse yourself into the cool water of the swimming pool, intentionally close to the Cha-La bar. There is nothing much better than being served your favorite cocktail at dusk after you take a swim in the gentle waters. You could also try a rejuvenating session of the Aqua Zen classes that are offered regularly for the guests. So, step out of your private pools on one of your days here, and spend a lovely evening at the Keemala pool. Inquire about the Aqua Zen classes at the front desk to find a time that suits you the best. All the rooms are non-smoking. If you wish to request an extra crib or bed, request the management in advance. If you wish to travel with your pet, this resort is not the ideal choice as they have a No Pets policy. Infants from 0 to 1 year can use a cot for free or use an extra bed for an additional price of THB 4,000 per child per night. Children from 2 to 11 years and guests above 12 years can use an extra bed for an additional charge of THB 4,000 per person per night.